When I make my posts I add the box and line score of the games when possible. There are size limits to the post constraints so in games like yesterday’s soul-crushing 9-8 defeat in Denver, I cannot post the box score because it is too long thanks to all the pitchers used. The real turning point of the game was Kelby Tomlinson’s error. Umpire screening or not, that play has to be made in Coors Field. It was a sure inning-ending double-play with Bum cruising. Instead, it gave the Rockies runners on first and third before Trevor Story did his three-run bomb act. In Denver you simply cannot give a Rockies team, with their much better line up, any second and third chances. Tony Watson is in a slow nosedive to oblivion since the All Star Break. It’s time to for the team and the organization to look into the stark contrast compared to his sterling first half. 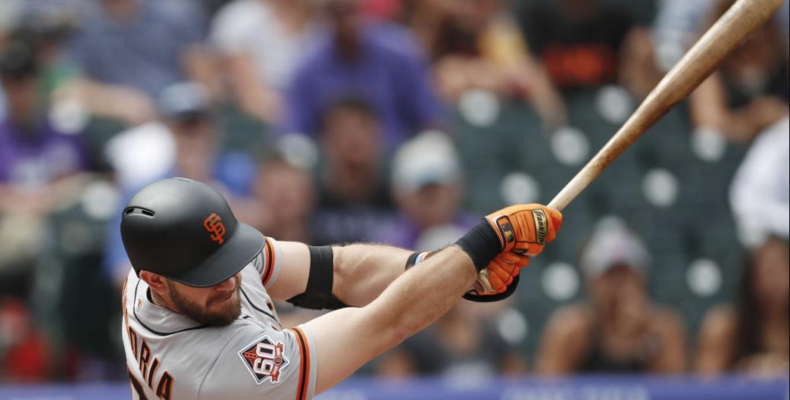 Chris Shaw’s pinch-hit moonshot was not only the first hit of his career, it was also the first pinch-hit Major League hit debut for a Giant since 2000. It was beautiful. It was amazing. It left me gasping and stunned. It was as if Gorkys himself drew up the perfect left-handed home run hitter with the perfect swing to craft perfect home runs. It was 468 feet of beautiful. Chris Shaw should play every day and against both lefties and righties. Belt is hurt. BCraw is hurt. Whether we like it or not, the kids are going to play more and more. Tonight D-Rod is pitching. The locks will flow and the Giants will be searching for an elusive victory in Denver after losing 89 of their last 90 at Coors.